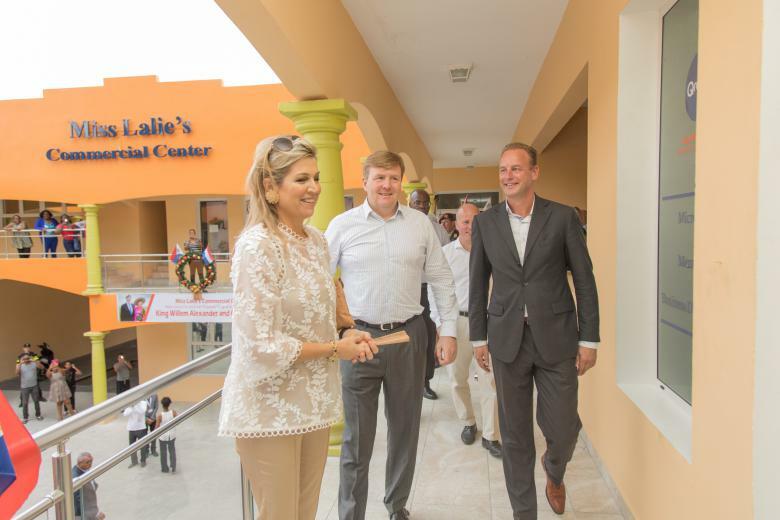 His Majesty King Willem Alexander and Her Majesty Queen Máxima paid a visit to entrepreneurs on Sint Maarten who were financed by Qredits. In light of recent devastation caused by Hurricane Irma early September the royal couple decided to tour the island to see the effects for themselves and see what was needed for effective rebuilding. King Willem-Alexander had also visited the affected area a few days immediately after the tropical cyclone. As an active champion of 'inclusive finance', Queen Máxima had conversations with several entrepreneurs at the Qredits office. Sade Hodge was one of them who got to meet the royal couple and share her personal story with them. Sade became a victim of the havoc that the hurricane wreaked. Right before the storm she had completely renovated her hair salon 'Tropical Hair', but afterwards it was totally destroyed. Thanks to a loan from Qredits this brave young entrepreneur is able to rebuild her business and slowly pick up her work and life again. The King and the Queen have visited the islands of Saba, St. Maarten and St. Eustatius since Thursday 30 November. Today is the last day of their visit in the Caribbean part of the Kingdom. Qredits helps entrepreneurs to successfully start or invest in their company. We offer mentoring, online tools and financing up to €250,000. Our goal is to help entrepreneurs make their dreams a reality. Trusting in the strength of entrepreneurship and good plans. We want to look ahead and offer new chances. To better facilitate the issuing of microcredit (loans up to €50,000) the European Union has made the following guarantee facilities available which Qredits successfully applied for. Read more.